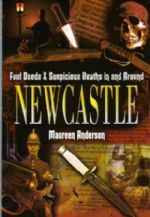 FOUL DEEDS & SUSPICIOUS DEATHS IN AND AROUND NEWCASTLE. Softcover. In times gone by Britain was in the grip of superstition and in the 17th century witch mania swept the country. Sadly, Newcastle was one of the towns that took it upon itself to convict and execute 15 so-called witches. As the 18th and 19th centuries dawned the town became extremely wealthy because of the many natural resources nearby. This prosperity also brought its problems with workers descending on the area. The housing was cramped, inadequate and unsanitary; wages were low so poverty was rife; work in the factories and mines was hard with long hours. When there was time to relax all too often it was in the many beerhouses, pubs and inns. Child neglect, domestic violence and brawls were common and often ended in death. These gruesome tales centre on Newcastle but also include towns in the immediate vicinity such as Gateshead, Morpeth, South and North Shields and Tynemouth. Some of the events have been well documented others are little known. All have one thing in common; they are examples of man's inhumanity to man. Illus., Sources, Index. 176pp. 8vo. New.